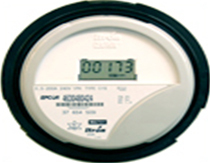 There are three different types of meters used by NEVLEC; the Clock Meter, the Dgital Meter and the Electric Meter. If and when the total number of units recorded exceeds 99,999 or 999,999 the meter starts again at 0. The total units used are shown by a row of numbers. Always remember that the reading on a digital meter is the total number of units used. If and when the total number of units recorded exceeds 99,999 the meter starts again at 0. 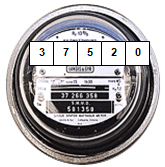 A digital meter has a row of numbers consisting of a total of five numbers. Write down the numbers as they read from left to right. The reading taken would be subtracted from the previous reading on your bill, which would give you the total units used for the month. 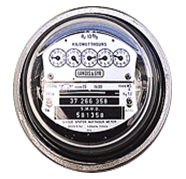 Keep in mind that when the meter readers read your meter, they do NOT set it back to zero. Therefore the dials keep turning until the next time the meter is read. Each of the five dials represents one digit of the present reading. The dials move both clockwise and counter clockwise. If you cannot tell if a hand is past a number or not, simply look at the dial to the right. If the clock to the right has passed zero, then the hand is pointing to the correct number. If the dial to the right has not passed zero, then use the smaller number. The electrical meter works with electricity if there is no electricity the meter will stop and will resume when it receives electricity again. The electrical meter will alternate between three screens. The KW screen, the KVA screen and the KWH screen. When reading your meter however, ensure that you write down the reading from the KWH screen.